Moroccan architecture dates from 110 BCE with the massive pisé (mud brick) buildings. The architecture has been influenced by Islamization during the Idrisid dynasty, Moorish exiles from Spain. Morocco is in Northern-Africa bordering the Mediterranean and the Atlantic. 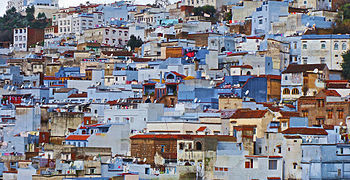 The country's diverse geography and the land's long history marked by successive waves of settlers and military encroachments are all reflected in Morocco's architecture. The conversion of the Berber tribes in Morocco to Islam by Idris I of Morocco greatly influenced the overall architectural style of the country. The elegance of Islamic features is blended in and adapted into buildings and interior designs such as the use of tiling, fountains, geometric design and floral motifs. Which could be seen in mosques, palaces, plazas as well as homes. The materials chosen for the interiors of Moroccan classical architecture, are due in part to the necessity of cooling in the arid land climate of Morocco. Tiles – Zellige tiling, often wrongly labelled "mosaic", is used to decorate the surfaces of buildings and objects, principally interior walls, floors, and fountains. Modern use of zellige has extended the use to furniture and other interiors. Fountains – Before the conversion, water was already an important part of Moroccan culture; however, Islam made water much more important functionally because of the ritual ablution before prayer. Thus, fountains, also representing paradise, could be found everywhere in order to serve everyone. Mosques – Following the introduction of Islam, mosques were built in Morocco with their distinct architectural features. Geometric Design and Floral Motifs Arabesque – Based on Islamic beliefs, avoiding the use of human or animal images is preferable resulting in the spread of floral motifs (arabesques) and geometric patterns. The motifs in Moroccan architectural decor are chiefly carved into stone, plaster and wood. Moroccan Islamic architecture is not confined to the country. For example, Sheikha Salama Mosque in the UAE city of Al Ain has two minarets which partly look Moroccan. Arches – Arches are common feature in Morocco, which can be divided into two types. The first arch is the horseshoe which is clover shaped. The second is cusped like a rounded keyhole. These are called Moorish arches. Tiling – Overlapping roof tiling became popular after the influence of Spain; the tiles are mostly hand glazed. Buildings could not be higher than four stories. Land use regulation required twenty percent of a planned area to be courtyards or gardens. Balconies must not overlook neighboring residences. Roofs of all buildings should be flat. The building regulations maintained the country's preexisting architectural features and balanced the rapid urbanization. The Riad also known as Dar is the Moroccan traditional house, which normally has two or more storeys around a courtyard. Villas are larger stand-alone housing in the urbanized area which do not need to follow traditional architectural style. Arches, most often the horseshoe arch are used in almost every aspect of Moroccan housing whether it is doors, entrances, windows or niches. Domes are often integrated with altars or commemorative monuments as well as modern villas. The interior doors of villas are usually oversized and decorative. In contrast, very small doors are used in dars. Doors are often adorned with delicate metal work, carving or color. In contrast with doors, windows in Moroccan architecture are often unremarkable. They are normally arched glass panes with fewer adornments compared to doors. Mashrabiya is an Islamic dowel work, made by carving large wood partitions in elaborate geometric patterns. Its purpose is to conceal the women from the visitor’s prying eyes according to Islamic tradition. The fountain is a conspicuous feature in every house, often made of marble or cement. It is built in the heart of the courtyard, living room or guest room. A small doorway in Ben Youssef Madrasa, Marrakech. The wooden doors are carved with a girih pattern of strapwork. The arch is surrounded with arabesques; to either side is a band of Islamic calligraphy, above colourful geometric zellige tilework. Woodwork can be found in both urbanized and more traditional areas of Morocco. The woodwork serves as the main finishing. This intricate woodwork can be found on various surfaces of buildings especially the interiors, such as wall, ceiling window, gallery and balcony. The wood itself does not need to be finished or painted after the long process of delicate carving. The plaster used for sculpting is called "gabs" or "jybs" in Moroccan, with the gypsum extracted abundantly from quarries in Safi, Asni, Meknes and Ouazzane. Tadelakt, qadad, and non-waterproof plasters are used. They may be polished smooth or elaborately carved into yeseria. Copper, bronze, iron and brass are materials commonly used for studs, door knobs, window frames and door frames as well as room partitions. A wide variety of ceramics is produced in Morocco. The painted and glazed ceramics are used for architectural work and tableware. Some are commonly used as roof tiling and decorative zellige tilework. The process of tiling, arranging and cutting them requires expertise in order to deliver a detailed piece of work. Morocco is known for their vivid and colorful design. However the diversity of colors that are included in the design all holds different connotations. White White, Ivory, Beige Cleanness, Good luck, Beauty, Femininity. Based on Muslim belief these colors connote moral qualities. Commonly found in textiles using different materials. As a complement to other Moroccan patterns that use darker colors. Black Black, Soft Black, Smoke, Brown Though the scheme is popularly used, however it holds a negative connotation. Believe that these colors are likely to bring bad luck and grief. Mosaic, Carpets, Textiles. However it is use frequently in various items since it is a base color in their design. ^ Ypma, H. (2010). Morocco modern. New York: Thames & Hudson. ^ Sharing sense: Or, how ethics might be the subject matter of architectural aesthetics | Leatherbarrow | ArchitecturePhilosophy. (n.d.). Retrieved October 9, 2015. ^ Bing, A. (2010). Moroccan architecture. Lonely Planet. Retrieved October 9, 2015. ^ The Rough Guide to Dubai. Rough Guides UK. Penguin. 2016-11-15. p. 266. ISBN 0-2412-9865-2. ^ Wilbaux, Quentin; Lebrun, Michel; McElhearn, Kirk (2008). Marrakesh: The Secret of Courtyard Houses. www.acr-edition.com. ISBN 978-2-86770-130-6. ^ Jereb, J. (1996). Arts & crafts of Morocco. San Francisco: Chronicle Books. ^ Aboufadil, Y., Thalal, A., & Raghni, M. (2013). "Symmetry groups of Moroccan geometric woodwork patterns". Journal of Applied Crystallography, 46, 1–8. ^ Montague, M. (2012). Marrakesh by design: Decorating with all the colors, patterns, and magic of Morocco. New York: Artisan.